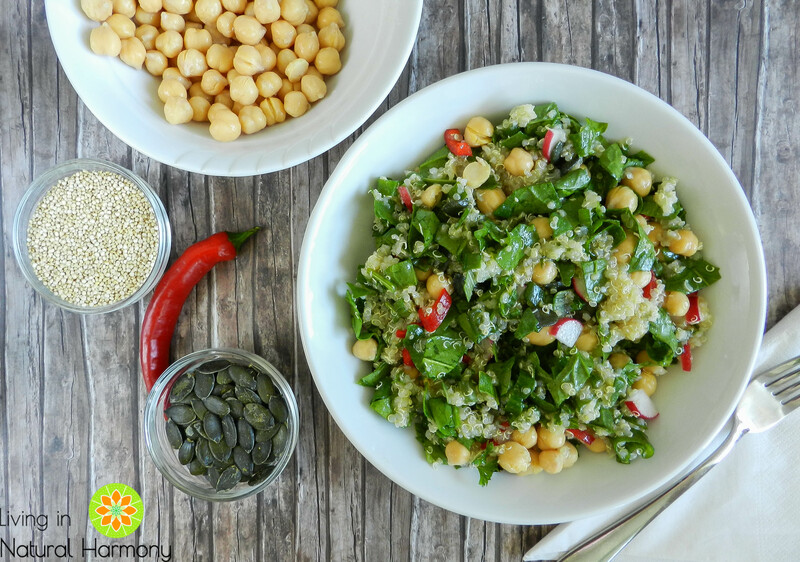 Today, I would like to share with you an easy, practical and nutritious lunch recipe that you could actually take to work (or anywhere you want): a quinoa and chickpea salad. I find it very suited for this season! 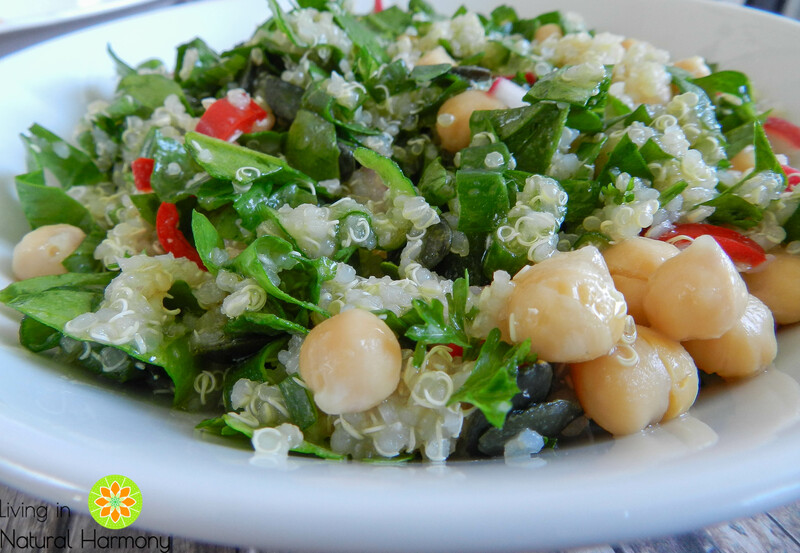 It is rich in plant protein and many vitamins and phytonutrients that will help keeping you healthy and fit :). 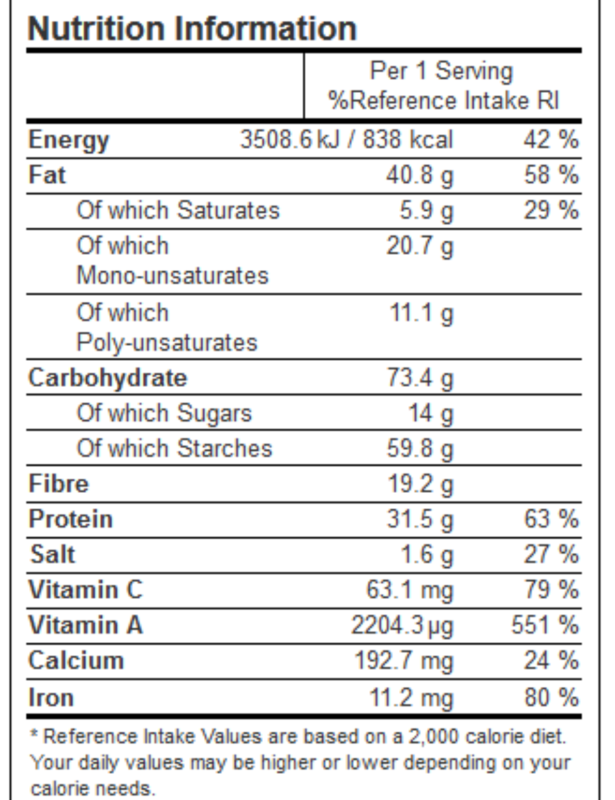 You can check below the recipe its nutrition information. If possible, please try to buy organic produce, which is not only better for you but also for the environment. Wash the quinoa well using a sieve (if possible, let it soak in water for some hours). Cook the quinoa in about 250 ml of water for 15 min. While the quinoa is cooking, wash and cut all the vegetables and herbs in small pieces. Transfer the quinoa to a bigger bowl (you will need to mix the remaining ingredients) and let it cool down. 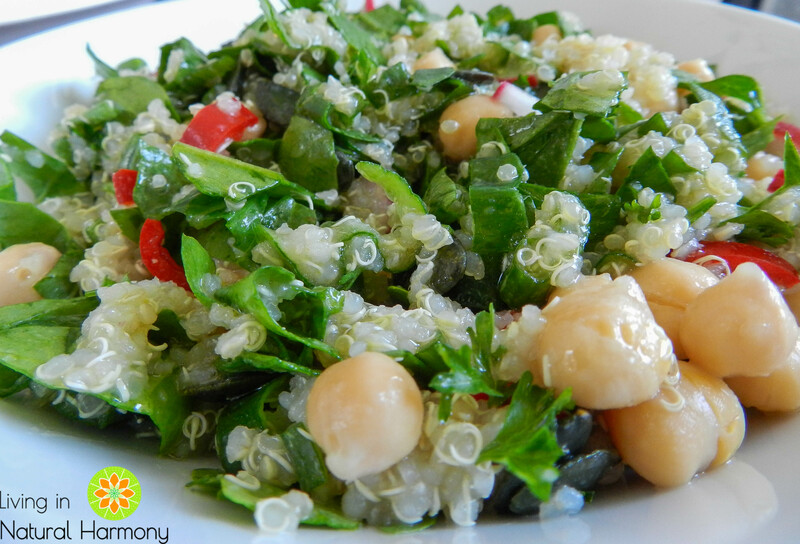 When the quinoa is almost cold, add all the other ingredients (except the ones of the dressing) and mix well. Blend all the ingredients of the dressing together and add this to the salad only before eating. You can store this meal in the fridge for up to 3 days. 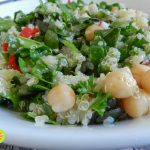 * You can buy already cooked chickpeas, but please make sure that there are no other added ingredients (except salt – but if you have the choice, then buy them without salt) and that they come is a glass jar, not a can! For environmental and health reasons, I am completely against cans. Cans are usually coated with BPA, which you might have already heard that beyond other effects, it is an endocrine disruptor. If possible, cook the chickpeas yourself. For that, you will have to soak the chickpeas overnight and then cook them for about 20 min in a pressure pot. A tip that I can give you and that I find very useful for myself: cook a lot of chickpeas at once, and then freeze them in several boxes. When you need them, you have them already done, they just need to unfreeze and that’s it! **Although this is opcional, I really find this enhances the taste of the salad; alternatively, you could add a pinch of black pepper. I make a very similar salad every day to take to work but I use sprouted lentils instead. I sprout alot of things….mainly broccoli sprouts. When I do eat chick peas I admit, although organic, they do come from a can. The can says”non bpa lining”, but I know that there is just another nasty chemical lining it. I will try to break my habit of canned beans. I love sprouting seeds and legumes too! I am planning to write soon an article about sprouting.